Former USGS scientist, Jeff Johnson, performed key research on the detection of dust on the Martian surface. This work explored the laboratory thermal infrared and visible/near-infrared spectroscopy of palagonitic dust coatings on rock substrates and experimentally shocked feldspars and pyroxenes. The masking effect of aeolian-deposited dust coatings on rock and soil surfaces hampers remote sensing investigations in visible to thermal infrared (TIR) wavelengths on both the Earth and Mars. Soil-like coatings are present on most surfaces at the Viking, Mars Pathfinder, and Mars Exploration Rover landing sites. In the thermal infrarared relatively thin silicate coatings (<50µm) can obscure the spectral character of underlying materials and significantly reduce spectral contrast, making mineral identification more difficult compared to dust-free surfaces. Understanding the effects of dust coatings on rock surfaces will help identify more precisely the mineralogical and chemical compositions and variability of rocks and soils on Mars. To study the spectral effects of dust coatings, we acquired thermal emission and hemispherical reflectance spectra (5-25µm; 2000-400 cm-1) at Arizona State University (ASU) and the University of Hawaii (UH) of basaltic andesite coated with different thicknesses of airfall-deposited palagonitic soils, fine-grained ceramic clay powders, and terrestrial loess. 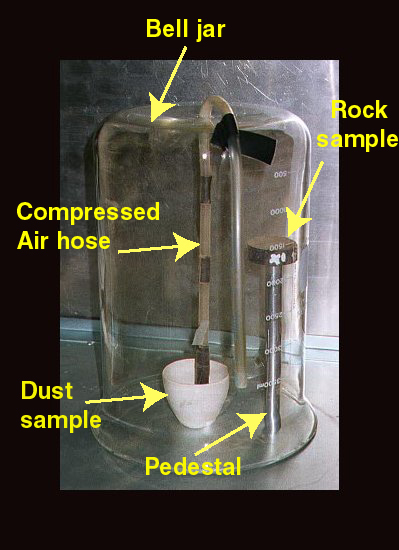 To mimic the aeolian deposition of dust onto rocks on Mars, a simple airfall deposition technique was used in which JSC-1 Mars analog soil (wet-sieved to <45µm) was elevated by a pulse of compressed air and allowed to settle onto the substrate within an enclosed bell jar (link to photo above). Average coating thicknesses were determined using a vertically calibrated microscope to measure the focus distances between the substrate and the coating at 25 locations on the coated sample. Areal coverage was determined using digital image processing techniques on photomicrographs (link to discription above) of the coated samples (Johnson et al., 2002 available above). Visible/near-infrared (400-2500 nm) spectra of the coated samples were also acquired and studied using two-layer radiative transfer scattering models (Johnson and Grundy, 2001). The surface of Mars records a variety of shock pressures from impact events, as suggested by petrologic analyses of the Martian meteorites and the abundance of impact craters on the surface. The effect of high shock pressures on TIR spectra of common rock-forming minerals and rocks is both an additional complication to deconvolution of Thermal Emission Spectrometer (TES) data and a means by which highly shocked materials can be identified and mapped on Mars. The disordering effects of high pressures have been shown to alter TIR spectral features in laboratory transmission and absorption spectra of quartz, feldspars, pyroxenes, and olivines. To study the effect of shock pressures on TIR spectra of these minerals, we performed shock recovery experiments at the Flat Plate Accelerator laboratory at JSC on orthopyroxenite, anorthosite, and albitite rock samples over peak pressures from 17 to 63 GPa. We acquired emissivity and hemispherical reflectance spectra (350-1400 cm-1; ~7-29 µm) at ASU and UH of both recovered coherent chips and powdered portions of shocked and unshocked samples. The results show systematic changes with increasing pressure in plagioclase feldspar spectra due to depolymerization of the silica tetrahedra. Conversely, very little change is observed in the pyroxene spectra even to pressures of 63 GPa (Johnson et al., 2002 available above) and (Johnson et al., 2003 available above). Use of these spectra as additional end-members in deconvolution models will help identify more precisely the mineralogical composition of rocks and soils using linear deconvolutions of data from TES, Mini-TES, and THEMIS. Additional visiable/near-infrared spectra of the shocked plagioclase powders were acquired at the RELAB facility. These data demonstrated an interesting variation in overall reflectance that correlates with the onset of maskelynite formation (Johnson and Hörz, 2003 available above). For more information please contact Jeff Johnson at Johns Hopkins University Applied Physics Laboratory (Jeffrey.R.Johnson@jhuapl.edu).